The light amethyst rounds are 12mm in diameter, and are vintage West German opalescent glass. A vintage Japanese silver plate rose motif slide clasp completes a bracelet that measures approximately 7-3/4 inches. 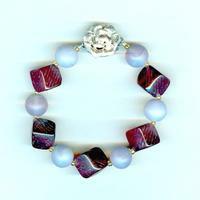 It's another fabulous bracelet from SPARKLE PLENTY.